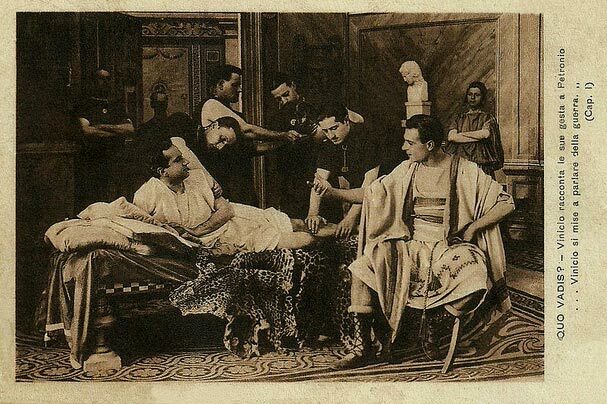 Considered by many to be the first worldwide blockbuster of cinema, QUO VADIS, made in 1912 and released in 1913, is one of the first 2+ hour long epic to draw audiences back 100 years ago. It stayed in a first class Broadway for nine months from April to December 1913. Director Enrico Guazzoni would be a master filmmaker in the PEPLUM genre. One just has to look at his list of films to see how influential his films were (link). With titles like FABIOLA (1918), THE SACK OF ROME (1920), JERUSALEM LIBERATED (Mighty Crusaders), THE PIRATE OF MALAYSIA (1941), his films read like a comprehensive list of titles made during the PEPLUM explosion of the 1950s/60s. Sadly many of his films are considered lost. 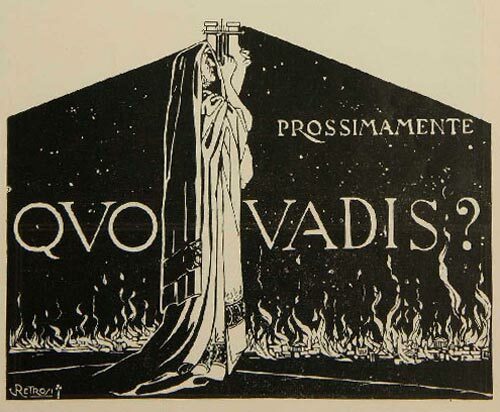 QUO VADIS is often cited as a "lost" film but it's not. There are several copies in to be found at cinemateques in different European countries. There are some clips on Youtube. The film, like so many of the silent era, has some interesting behind-the-scenes legendary stories including an extra eaten by lion. The book by Henryk Sienkiewicz would be remade several times since the 1913 film. Gustavo Serena as Petronius Arbiter and Amleto Novelli as Marcus Vinicius. Those roles were made famous by Leo Genn and Robert Taylor in the 1951 MGM super production.